,LTD 1)Giant located in Huangdao Zone of Qingdao city from where only half an hour to the Qingdao Sea port by car. 2)Professional manufacturer in China:Quality is guaranteed by Serious and responsible QC team/Professional production and export teams. 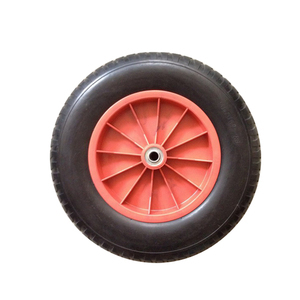 3)Our company mainly supply various models of metal products including wheel barrows, hand trolley,garden utility tool cart,kids wagon cart,ects. 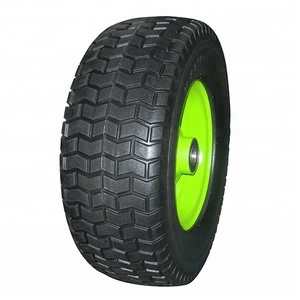 We mainly deal with all kinds of wheels, casters, bicycle & motorcycle tires, tubes and flaps, trolleys and carts,etc. Our products are widely used in many areas, including industry, garden, farm, warehouse, and the like. In order to meet customer needs better, we cooperate with customers to open new molds and make customized products for them. Our products are popular to over 150 countries and areas all around the world and we enjoy much highly reputation from our customers. Contact with us Our Service 1.pre-sale services Act as a good adviser and assistant of client enable them to get rich and generous returns on their investments. 1)select equipment model 2)design and manufacture products according to clients' special request 3)train technical personnel for clients. 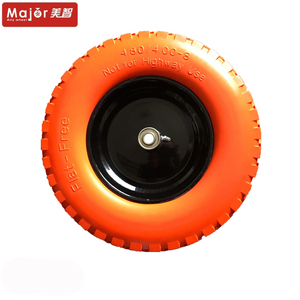 4.00-6 PU FOAM WHEEL, 400X6 WHEELS, 4.00-6 TIRES 4.00-6 wheel type:solid type without inner tube usage: wheelbarrow, hand trolley ,tool cart ect. 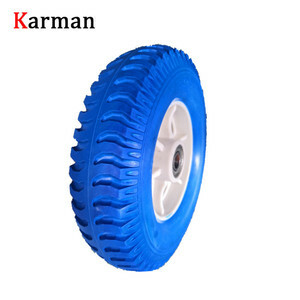 diameter of wheel:340mm width of wheel:82 mm weigt: 1.8 kg material of rim : plastic or steel bore diameter of bearing: 12mm, 12.7mm, 16mm. pattern: line, cross, flag ect . We will charge a little freight But we will return the charge if you place an order. Q: Can we come for a visit to your company9 A: Yes, of course. Q: How long the sample will be ready9 A: It takes about 3-5 days to make the sample after freight has been paid. 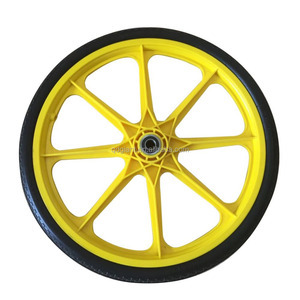 Qingdao Xinyuan Industry Co., Ltd.
PU Foam Wheel,Flat free wheel Model Number:3.50-8 Full range sizes High Grade Patterns:Diamond,Comb,Rib,Sand,Line,Square,Cross Flower . Sizes:2.50-4,3.00-4,3.00-8,3.25-8.4. 00-6,3.50-6,3.50-8,4.00-8,4.50-8,5.00-6,6.50-8 and so on. 3,What is your average production delivery time9 2-3 weeks against formal order and deposit. 6, I would like to have my own design products and qty is not that big, is it ok9 Yes, we can go with your customized design, no matter small or big qty. 8, What should I do if the products have any quality problems9 Just contact us via our phone or email. 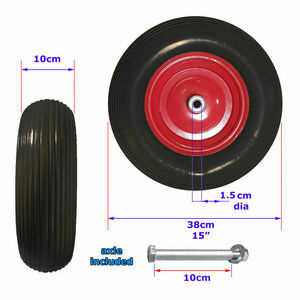 Alibaba.com offers 15,388 pu foam wheel products. About 55% of these are material handling equipment parts, 1% are ride on car, and 1% are scooter parts & accessories. 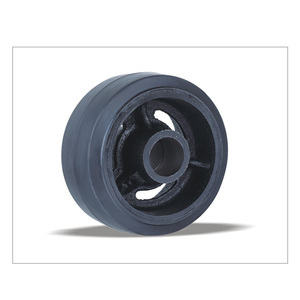 A wide variety of pu foam wheel options are available to you, such as furniture caster, office furniture, and case. You can also choose from executive chair, lift chair. As well as from pu, plastic, and synthetic leather. And whether pu foam wheel is office chair, or chaise lounge. 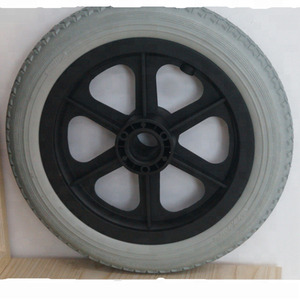 There are 15,412 pu foam wheel suppliers, mainly located in Asia. 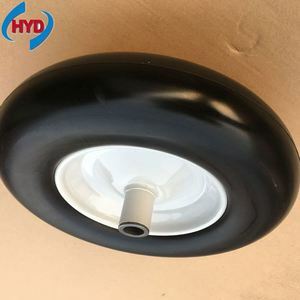 The top supplying countries are China (Mainland), Taiwan, and Hong Kong, which supply 99%, 1%, and 1% of pu foam wheel respectively. 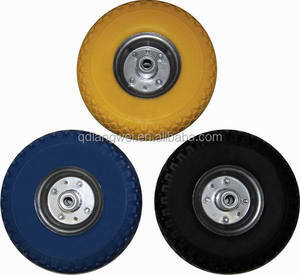 Pu foam wheel products are most popular in North America, Northern Europe, and Western Europe. You can ensure product safety by selecting from certified suppliers, including 2,677 with ISO9001, 430 with Other, and 376 with ISO14001 certification.